Judging by the things Bryant and her fellow commissioners told audience members at the Reilly Arts Center and those watching live on Facebook, it’s going to be much more than just a “good night” for Marion County in the days and months to come. In 2014, FedEx announced that it was building a distribution center in the Ocala/Marion County Commerce Park. It included a $150 million capital investment and more than 350 jobs to start. Monday’s gathering, titled “State of the County,” gave commissioners the chance to update their constituents on a variety of happenings. Bryant, who played host but frequently turned the stage over to her colleagues throughout the 45-minute presentation, kicked things off by touting the formation of the Ocala/Marion County Chamber and Economic Partnership, formed in 2011 when the economic outlook wasn’t bright. “It was at that time we knew we had to do something different, as the definition of insanity is doing the same thing over and over again and expecting different results,” she said. Chewy.com built a distribution center at the Ocala/Marion County Commerce Park. The online company has seen significant growth since it first opened in 2011 and now offers about 30,000 items for dogs and cats. Bryant also boasted about a partnership between Marion County, the city of Ocala and the private sector that created the Ocala/Marion County Commerce Park. AutoZone, which operates more than 5,000 stores in the United States, Mexico and Brazil, built a distribution center in the Ocala/Marion County Commerce Park. District 4 Commissioner Carl Zalak III said a new Florida Commerce Park, located on 900 acres on County Road 484 near Marion Oaks, will provide even more opportunities for businesses interested in coming to Marion County. “We have the advantage of location and opportunity and more than 21 million people that need to be served in Florida,” he said. The World Equestrian Center encompasses 3,400 acres that will include 2,399 mixed housing properties and 200 spaces for recreational vehicles. The facility will primarily host equestrian-related events, but also will showcase sporting events and competitions such as dog, cat and car shows. 243 rooms in a five-star hotel. Residents and visitors in Marion County have access to a variety of world-class trails. Stone said the plan also calls for a large-scale convention center on the property. Along those same lines, Bryant touted the fact that two million people visit Marion County every year. Marion County funded more than $175,000 in improvements to the Fort King National Heritage site through its bed tax. Commissioner David Moore, who represents District 1, agreed. He pointed out that the county has many miles of scenic trails and said improvements being made at the Fort King National Heritage site will draw even more visitors in the years to come. “The walls are up and ultimately Fort King will be a tourism driver,” he said. Three new fire engines and six new ambulance/rescue vehicles have been funded by sales tax money. The penny sales tax funded a new helicopter for the Marion County Sheriff’s Office to replace one that was destroyed in a crash in May 2017 while helping to battle a brush fire. District 3 Commissioner Jeff Gold, who has been involved with Marion County Fire Rescue for 35 years as either a volunteer or paid firefighter, said another success is the recent pay increase commissioners approved for firefighter/paramedics. The sheriff’s office has purchased 100 ballistic and SWAT vests with penny sales tax money. Finally, Bryant said she was proud to announce that commissioners have been working with state legislators to start the process of bringing a veterans nursing home to the county. And she said a replacement outpatient facility for veterans in Ocala also will become a reality. 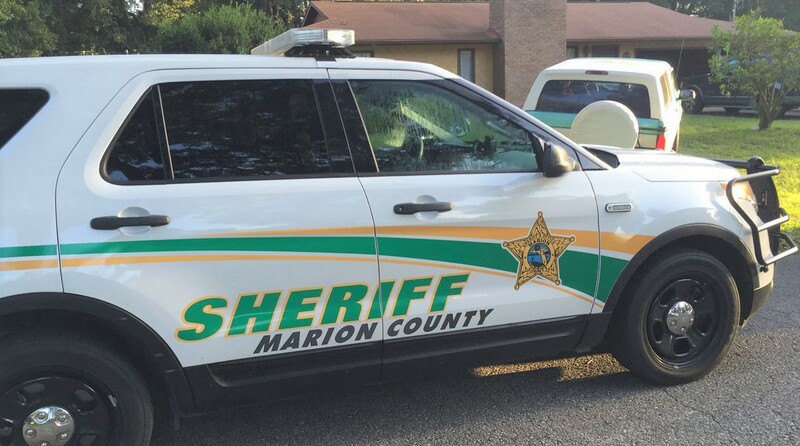 The Marion County Sheriff’s Office has received 69 new patrol vehicles that were paid for by penny sales tax money.